At the outbreak of the American Civil War, there were two types of sabers issued to the Federal Cavalry: "œlight" and "œheavy". The light version was popular, but the heavy model, dubbed the "œOld Wrist Breaker" was the one worth owning, as it was a superior weapon. Its 36 in. blade offered big reach advantages over most sabers, and its substantial weight gave it the leverage to easily crush bones and sever limbs or even a head with a single blow. The brass guard had three bars to protect the hand and the grip was wire bound leather and capped with a sturdy pommel. In its double ringed, steel scabbard, it could be easily attached to a saddle or to a belt. 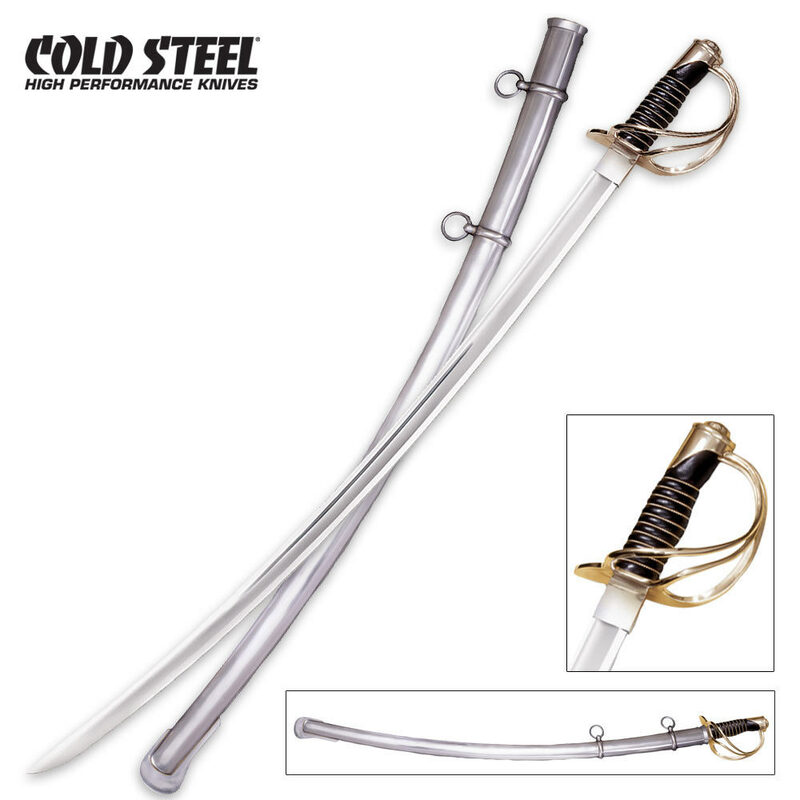 After examining and handling a number of original 1860 Heavy Cavalry Sabers, Cold Steel decided to make their own reproduction with a few improvements. The blade is made from 1055 carbon steel with a hard spring temper and will pass the British Proof Test. You want to know how good this is? Just look it up on youtube... they put the blade through the hood of a car! An elegant weapon. I have yet to test it in my back yard but it is -7F outside :-) so I will hold off for now. It came well packed and on time. What else but the best to expect from True Swords. Both the saber itself and the scabbard are very well made. The saber fits well and doesnâ€™t rattle. This is a cavalry saber so the curvature of the blade is a bit more than it is shown on the picture (maybe it is the angle of the shot). This is how it is supposed be. You can still do fencing moves on the ground, donâ€™t get me wrong. Mine came unsharpened; which is fine, I can sharpen it later. It looks unusual because the other products I have bought from Cold Steel came razor sharp. The saber comes with the British Proof Test certificate. British Proof Test is a controversary test with no historical reference you can find on the Internet but you can read about it on a few sword selling websites and Cold Steel itself. If nothing else this test will weed out any defective blades before they are sold. So whether this test was initiated by the British or somebody else it is a good thing to perform on a blade before you sell it. To sum it up â€“ I love it.